Most gardeners appreciate pushing the garden limits by adding a little of the tropics to the garden. This might mean a few Canna and maybe a Bougainvillea but it almost always means Hibiscus. Adding a few tropical wonders to the landscape can take you right back to paradise. 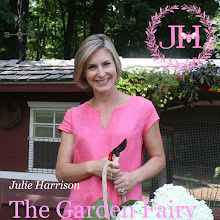 There are basically three types of Hibiscus: Tropical, Perennial (or Rose Mallow) and Rose of Sharon. In fact, the flowers and the leaves are very similar on all three. 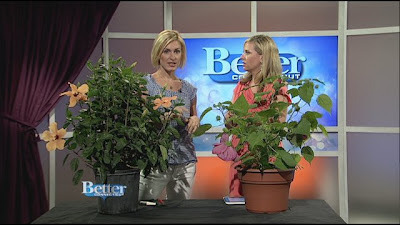 Today on WFSB's Better Connecticut, I brought two special guests with me, a Tropical and a Perennial Hibiscus. Click HERE to watch me talk about them. Both are from Revay's Garden and Gift Shop in Broad Brook, Connecticut. It took me a ridiculously long time deciding which plants to pick. There is a huge selection on Perennial Hibiscus in shades of pink from light to dark and even a white with a bright pink throat. Each had more buds than the next. Be sure to support your local Mom and Pop Garden Shop if you need your tropical fix. I support Revay's Garden Shop because they are the chic garden center close to me with awesome plants. One of the things I love about Perennial Hibiscus is that they get fired up (in terms of flowers) right when all of your other perennials are done flowering. Give these tall ladies a lot of room because they can get pretty big, sometimes reaching 6-8' tall. They will command more attention in the back of a perennial boarder with bloom that can reach 12" in diameter. Remember that Tropical Hibiscus really are, well, tropical. If you have cold winters like I do in Connecticut, these exotics need to stay cozy and protected in your house over the winter. You can also treat them as annuals and just replace them every year. I guess it just depends how deeply you fall in love with them. When I bring mine in, I will walk you through the process step-by-step. Again, click HERE to watch my video clip on Hibiscus!